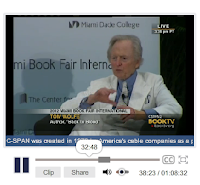 2012 Miami Book Fair International: Tom Wolfe, "Back to Blood" - Tom Wolfe speaks about his latest novel, "Back to Blood," during the opening night of the 2012 Miami Book Fair International. The novel presents Mr. Wolfe's take on the city of Miami. Mr. Wolfe will be interviewed by former Miami mayor, Manny Diaz, and take questions from the book fair audience. The Miami Book Fair International is held annually in November on the campus of Miami Dade College. Tom Wolfe is the author of several nonfiction titles, including "The Electric Kool-Aid Acid Test," "The Pump House Gang," and "The Right Stuff," which was a recipient of the National Book Award for General Nonfiction. He has also the author of the novels, The Bonfire of the Vanities," "A Man in Full," and "I Am Charlotte Simmons." For more, visit: tomwolfe.com. New Year's Resolution Reading List: 9 Essential Books on Reading and Writing | Brain Pickings: "As far as New Year’s resolutions go, hardly anything does one’s mental, spiritual, and creative health more good than resolving to read more and write better. Today’s reading list addresses these parallel aspirations. And since the number of books written about reading and writing likely far exceeds the reading capacity of a single human lifetime, this omnibus couldn’t be — shouldn’t be — an exhaustive list. It is, instead, a collection of timeless texts bound to radically improve your relationship with the written word, from whichever side of the equation you approach it." Published: November 14, 2012 “SWAMPLANDIA!,” a novel by Karen Russell that was a finalist for the 2012 Pulitzer Prize for Fiction, is named for the fictional gator-wrestling theme park in the Florida Everglades it depicts. Wildly imaginative, the book takes the reader through eerie mangrove swamps, expansive saw grass prairies and kitschy roadside attractions. “On the West Coast, everyone would ask, ‘How did you come up with that?,’ ” recalled the 31-year-old Miami native. “But in Florida, it was just realism. People would say, ‘The dad character — that’s got to be Jungle Leary.’ ”For the novel and her forthcoming book of short stories, “Vampires in the Lemon Grove,” Ms. Russell retraced her childhood trips to the Everglades. Below are edited excerpts from a conversation with her about rediscovering them. Q. Where in the Everglades would you go as a child? A. . . . As you go back toward Miami, it’s a completely different ecosystem from the Gulf. My mother would take us biking on this trail in Shark Valley, a saw grass prairie lined with alligators. It’s pretty severe looking, like an African savanna, just a few inches lower in elevation than the green mangroves, and this creates such a different landscape. Joan Didion on Keeping a Notebook | Brain Pickings: "As a lover — and keeper — of diaries and notebooks, I find myself returning again and again to the question of what compels us — what propels us — to record our impressions of the present moment in all their fragile subjectivity. From Joan Didion’s 1968 anthology Slouching Towards Bethlehem (public library — the same volume that gave us her timeless meditation on self-respect — comes a wonderful essay titled “On Keeping a Notebook,” in which Didion considers precisely that . . . "
9:50AM EST November 17. 2012 - What should you read this weekend? USA TODAY's picks forbook lovers include new 4-star fiction from Barbara Kingsolver and Alice Munro, plus Louise Erdich's National Book Award-winning novel The Round House. To fete the launch of Kate Moss' new book, the 34-year-old joined the supermodel author along with Marc Jacobs, Florence Welch, Donna Karen and more at the London Bookmarc store on Thursday. So how did she dress to impress the fashion elite? On to books. This week the National Book Foundation announced this year's National Book Awards for this year. I have no quibbles here, as I haven't read any of these books (still working on 2007 award winners), but Louise Erdrich is a fine writer and I suspect well-deserving of ... In happier news, National League Cy Young Award winner, and all-around good guy, R.A. Dickey, author of this year's autobiography Wherever I Wind Up, has inked a deal to write three children's books.